Thank you President and thank you for giving CITES the opportunity to address today’s Plenary session, which is a first for the Convention. I would also like to express our sincere thanks to Executive Director Yury Fedotov and his good team for their extraordinary support for CITES and the fight against wildlife crime. Distinguished delegates, over the past decade the world has been confronted by a surge in illegal wildlife trade. This highly destructive illicit trade is not only decimating wildlife populations but is seriously hindering development, frustrating efforts to eradicate poverty, and creating instability. As was shown in the first UN World Wildlife Crime Report, wildlife crime is well organised and transnational. It affects over 7,000 species of wild animals and plants and happens across every region of the world. Transnational organized crime groups have targeted high value species without regard for wildlife or people’s lives. These criminals are corrupting local officials right across the illegal supply chain, recruiting and arming local poachers, creating insecurity and propelling local communities into a poverty spiral. They are involved in money-laundering, tax evasion and fraud. They are hard to beat but they must be stopped. The fight against wildlife crime cannot be won by wildlife agencies alone. 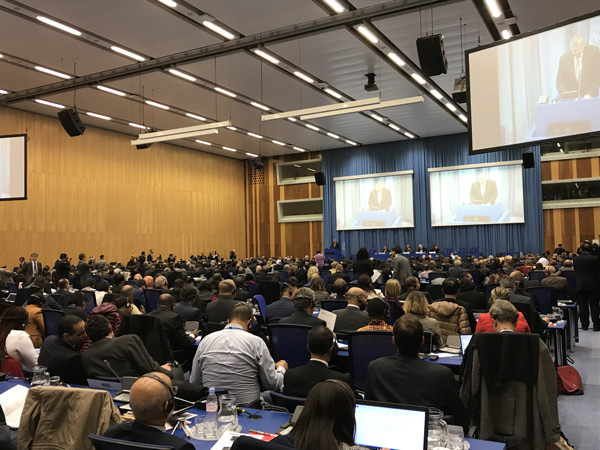 It needs the direct involvement of the international and national agencies that have the mandate, expertise and resources to combat organised crime and corruption, and that is exactly what is happening and why we are delighted to be able to address you today. We cannot win this fight without you! Reflecting a heightened level of political concern over the devastating impacts of poaching and the trafficking in wildlife on both wildlife and people, in 2015 the United Nations General Assembly (UNGA) unanimously adopted the first ever dedicated Resolution on Tackling Illicit Trafficking in Wildlife. Several similar Resolutions have since been adopted, most recently in September of this year when the UNGA adopted a further powerful Resolution on Tackling illicit trafficking in wildlife, which reinforces the need to focus on key areas in the fight against wildlife crime, including countering corruption. The UNGA Resolution highlights the central roles of CITES, the UN Convention against Corruption (UNCAC), the UN Convention against Transnational Organized Crime (UNTOC) and the International Consortium on Combating Wildlife Crime (ICCWC) in tackling illicit wildlife trafficking. The Resolution also encourages States to treat wildlife crime as a serious offence where transnational organized criminal groups are involved. It calls upon member States to implement all of the relevant resolutions and decisions adopted at the 17th meeting of the Conference of Parties to CITES held in Johannesburg, South Africa last year, and requests UNODC to continue to support Member States in this regard, which is a reflection of how Member States see the inter-linkages between CITES and UNODC. The CITES Resolutions adopted at CoP17 include, for the first time ever, a powerful and dedicated resolution on prohibiting, preventing and countering corruption. Among other things, this Resolution calls on all Parties that have not yet ratified UNCAC and UNTOC to do so, and urges all Parties that have ratified them to effectively implement their provisions. Distinguished delegates, CITES is not looking to set up some parallel universe to address wildlife crime. Rather, all of the efforts under CITES are directed towards working within the exiting legal framework and at embedding the issue of wildlife crime into it. Central to this work is the ratification and full implementation of the UNCAC, as the UN Convention created to address corruption, which has been recognized by the UNGA and CITES Parties. Put bluntly, corruption is killing wildlife and impoverishing communities. We cannot afford to turn a blind eye to this serious challenge. We have no option but to confront corruption head-on by fully deploying the international agreements created to combat corruption and to regulate wildlife trade in a coherent manner. And I am pleased to report that cooperation between the UNCAC and the CITES is at an all-time high. We are working extremely well together to integrate the tools to prevent corruption, and to facilitate the prosecution and punishment of offenders developed through the UNCAC and UNTOC, with the international rules set for trade in wildlife by CITES. In 2010 we created the International Consortium on Combating Wildlife Crime (ICCWC), a consortium of the CITES Secretariat, INTERPOL, UNODC, The World Bank and the World Customs Organisation, to provide coordinated support at national and regional levels in the fight against wildlife crime. This Consortium is today fully operational and is delivering well-targeted support to countries on how to deploy the same tools and techniques used to combat other serious crimes and is currently developing anti-corruption guidelines. Within the UN, and wider international system, I can think of no better collective endeavour to achieve a common objective than what we are seeing underway through CITES, UNODC and ICCWC to jointly fight wildlife crime and the corruption that fuels it. And we are making headway, with African elephant poaching in 2016, while still too high, being down for the fifth consecutive year. There is a lot more to do but there is reason for optimism. We are on the right track and we are making progress in fighting the corruption and transnational criminals who are driving this highly destructive industrial scale illicit trade. If we persist – and we will – we will together bring to an end the surge in wildlife crime experienced over recent years.